The school has 2 Colours (flags) – the Queen’s Colour and the School Colour – Both of which are paraded almost every Sunday during the School year, as well as on Grand Day , our big end-of-year parade, inspection and prize-giving. 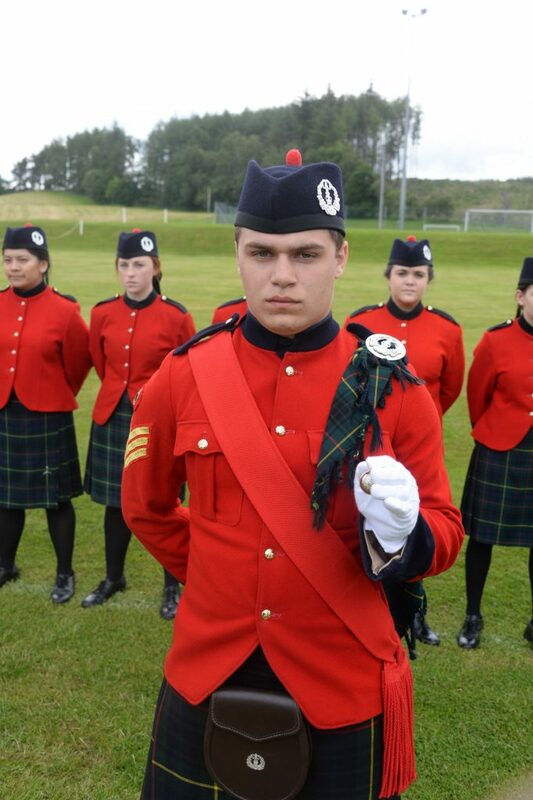 The pupil’s ceremonial uniform has changed little over the past 100 years, and its red tunic, kilt and Glengarry are familiar to all who know of the School. The school tartan is Hunting Stewart. Monitor and Prefects wear plaids and sashes with different rank badges, depending on seniority. The School also has a Colour party which is taken from senior pupils, they also wear rank badges. There are 5 parade Sundays each year, involving the whole school. As well as the parade there is music from the Pipe Band, a display of Highland dancing and a Chapel service which is at the heart of the morning’s activities. 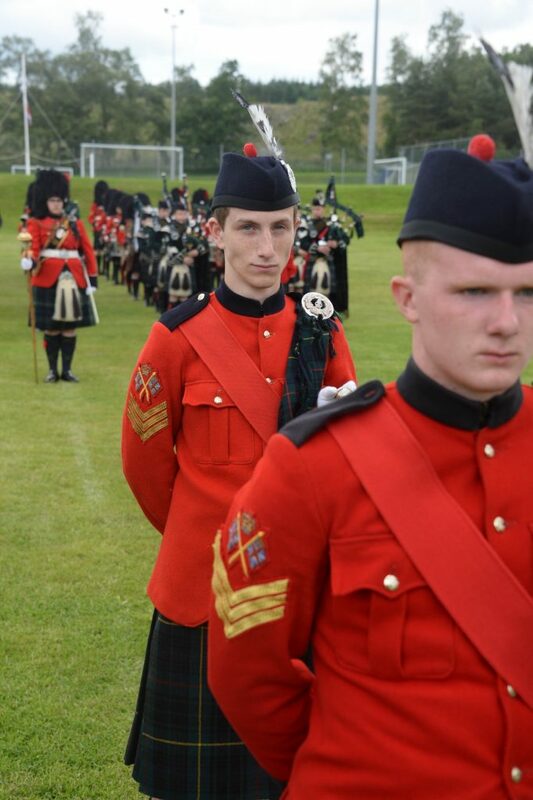 The School has its own Sergeant Major, Pipe Major and Highland Dancing Instructor. 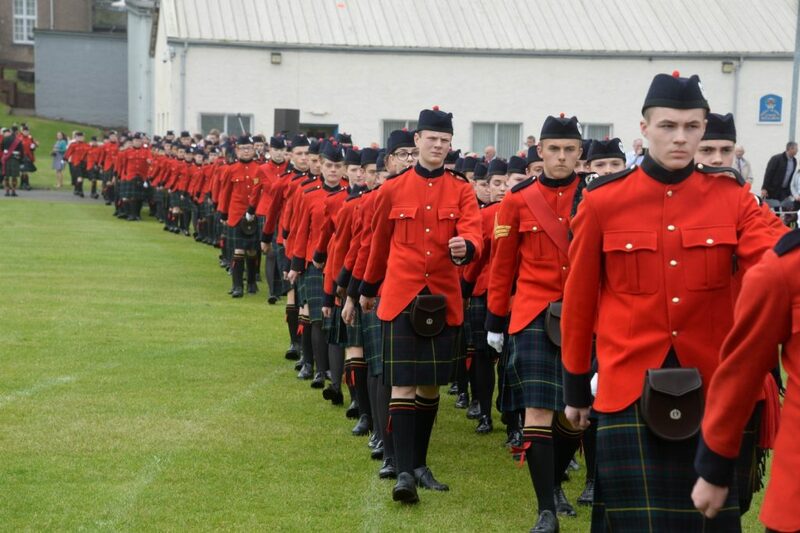 The P7’s pass off the square in December, and this called the ‘Rookies Parade’. They can then call themselves ‘Victorians’, and form up with rest of the school in future parades. The Commanders for this parade are all P7’s. We believe that the ceremonial aspect gives our pupils a sense of identity, of community, of pride in themselves and affiliation with their parent’s lives of service. No-one who has seen Queen Victoria School on parade can be in any doubt about the strength of feeling embodied there. I/C Colour Party – Three stripes with Colour badge above, Sash, Plaid, Double Garter Flashes, White Gloves. In the event of the I/C Colour Party also being a Monitor then they will also wear a small crown above the stripes. Senior Monitor – Senior Monitor wears a QVS Silver Braid badge on lower right sleeve, Sash, Plaid, Double Garter Flashes, White Gloves, Sporran with large school badge. All may wear school Highland dancing badge on upper right sleeve if qualified.